Ooooh, this is an amazing page spread. You can just imagine the size of the place they’re at. Wow. 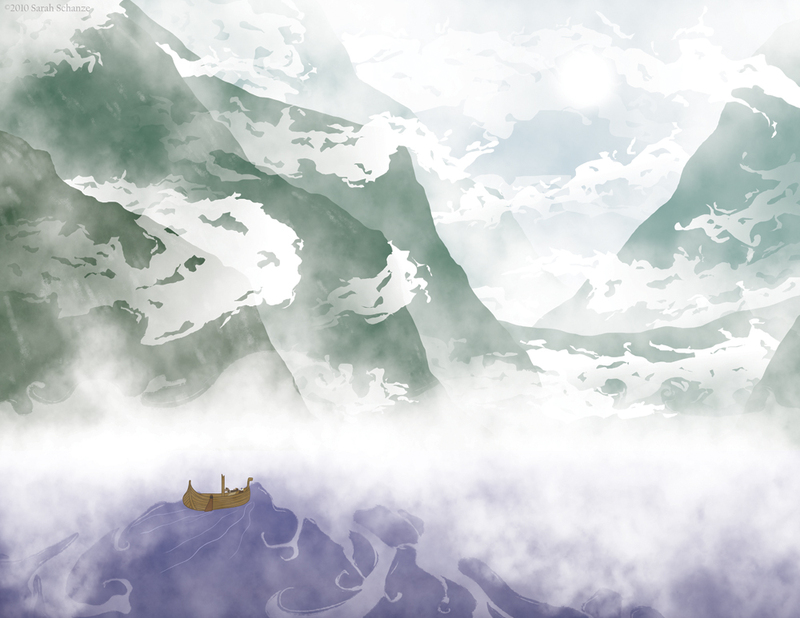 Awesome rendering of the mountains and mist. Aaaand I have a new background. How often is the comic updated? Thank you! Looking at pictures or Norway was certainly inspiring. Oh man, that shot is GORGEOUS. Looks so mysterious and almost ghostly *g* Beautiful! Awww thanks! I’m glad this page seems to be going over well (and I love your style ;D). Wow, this page really is epic! You’re really good at backgrounds. That’s something that, like I’ve told you before, I’m still working on. I think you’re mastered scale too. And yeah, you totally deserve a nomination. Awww, thank you! Backgrounds are actually my biggest bane. Organic, natural backgrounds are kind of easy, you can get away with more weirdness. I’ve yet to really dig into any urban backgrounds, but that’ll be coming up in a few chapters so I better get the shovel ready. Very nice 🙂 Always enjoy craggy snow/cloud swept backgrounds. Thank you! 😀 They are pretty to look at. I’m from Norway, and I feel right at home here. Marvellous work! this is definitely one of the best webcomic pages that i have ever seen. you totally rock! Thank you! 😀 This page was fun to create.